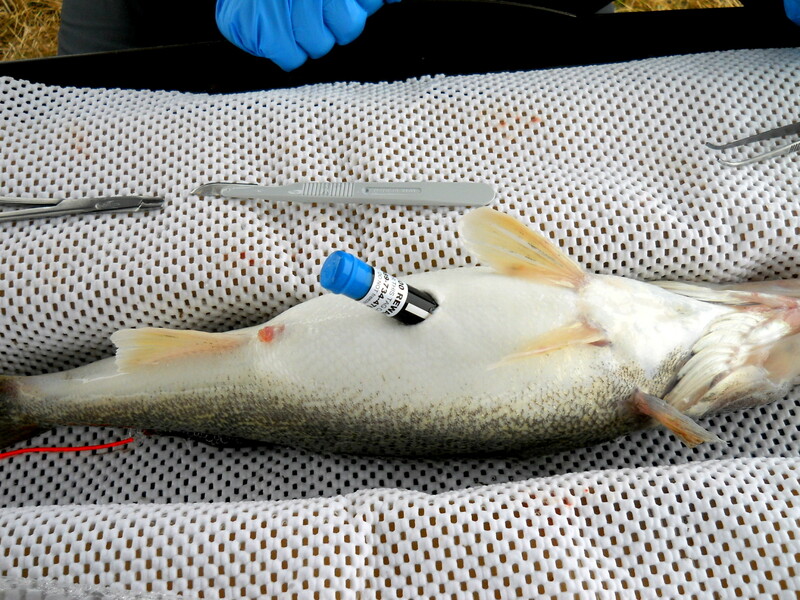 Acoustic telemetry transmitters (also called “tags’) are inserted into the body cavity of walleyes. If you catch a walleye with a transmitter, call the phone number on the tag to receive a $100 reward! Photo: Courtesy | Sean Landsman, Great Lakes Fishery Commission. Saginaw Bay is known as a walleye fishing haven. Literally millions of walleyes spawn there each year. State fisheries managers say the 1,143 square-mile bay is the single-most important place for walleye production on all of Lake Huron. But every spring, just about now, many of those walleyes begin move out into Lake Huron on a journey, one that may take them hundreds of miles away. Researchers studying their whereabouts are increasingly coming to know that old “marble-eyes” is a true traveler. Just why they go remains a mystery, but Hayden and others hope soon to have more answers. Hayden is embarking on the third season of a three-year study. What has been learned so far, from one year of processed data, is 56 percent of the Saginaw Bay walleye moved out into the lake; six percent turned left and headed north to Thunder Bay and beyond. Hayden’s research relies on radio-telemetry to track 245 radio-tagged walleye from the Tittabawassee River. Another 200 from the Maumee River on Lake Erie also have implanted radio-transmitters. Their travels are recorded by a network of submerged hydro-acoustic receivers. The devices pick up the transmitter signals. When Hayden and other researchers download the data, they get a clear picture of the route the fish are travelling. WHERE DO THE WALLEYE GO? Anglers have long-reported that Saginaw Bay walleye fishing slows down in summer, and researchers have long-known that walleyes moved from the shallow bay waters into the open lake. What wasn’t known was how far they travelled, their route, or when and if they returned. That understanding began to take shape once Hayden’s research commenced. “The distance they travel doesn’t surprise me, but the timing does,” said Dave Fielder, a Michigan Department of Natural Resources fisheries research biologist with the Alpena Fisheries Research Station. “It occurs earlier than I predicted. Previously we had evidence that it was a July or August phenomenon. Hayden’s research also showed that 63 percent of the migrating walleye returned to the Tittabawassee River to spawn. The Saginaw Bay walleye population is estimated at about 2.5 million fish. It has been estimated as high as 4 million fish. Walleye with internal transmitters can be identified by the two orange “spaghetti” tags on their back. Photo: Courtesy of Sean Landsman, Great Lakes Fishery Commission.been has a high as four million. The annual sport catch runs from 375,000 to 400,000 walleyes. The information being gleaned from Hayden’s study may eventually be used to help fish managers determine walleye allocations for the various recreational and commercial fisheries on the lake. Right now it is helping them understand their life history. Lake Erie walleye proved not to be a factor. None of the Maumee River fish showed up on the acoustic arrays in southern Lake Huron. That came as a surprise to Fielder. Prior jaw-tag studies in the early 1990s indicated that one percent to 1.5 percent of the estimated 70 million walleye in Lake Erie did migrate into Lake Huron. He speculated that those numbers dropped off because the fish were motivated to move in and feed before the Lake Huron alewife population collapsed. Once the alewives were gone, there was no reason to go. “We will have more information, in time, about their motivations for moving. The analysis is not complete,” said Fielder about the Saginaw Bay population. “They may be looking for cooler water temperature, but (if so) why aren’t they all going. It’s a real puzzle. Fielder said Saginaw Bay continues to be a great place to catch walleye. And anglers have been enjoying record catches. Assuming, of course, they are there when the walleye are too. This entry was posted in Uncategorized and tagged DNR, Fish, Fish migration, Fishing, Great Lakes, Great Lakes Fishery Commission, Michigan Department of Natural Resources, Nature, U.S. Geological Survey, Walleye. Bookmark the permalink. I helped the DNR tag walleye on the Tittabawasee several years back and I saw a post on a fishing forum where someone had caught one of the walleye I helped net and tag in Alpena that summer. Surprised me.